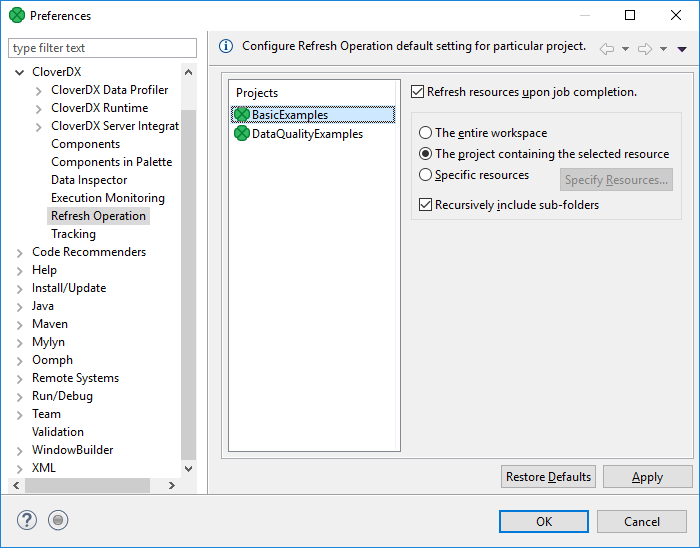 Refresh Operation lets you configure which resources should be refreshed after graph run on a per project basis. The refresh operation configuration is accessible from the main menu under Window → Preferences. Choose CloverDX → Refresh Operation in Preferences window. Choose the project in the middle part of the dialog and specify which resources should be updated. The Refresh resources upon job completion checkbox enables or disables refreshing of resources. Radio buttons on the right hand side let you choose between refreshing the entire workspace, the project containing the selected resource or specific resource. The refreshing can be performed in the selected directories or recursively using the Recursively include sub-folders option. Refreshing after graph run can be configured per particular graph, too. See Run Configuration.